It's the best time of day: adorable animal video o'clock. We all know pigs are delicious, but let’s not forget that they are also cute (especially the mini kind) and extremely smart. In a single lesson, the humans at British micro pig breeders Petpiggies managed to train these two tiny porkers to sit, simply by rewarding them with petting and apple slices. We challenge you to teach a dog to sit with just apple slices, even this vegetable-wearing one. 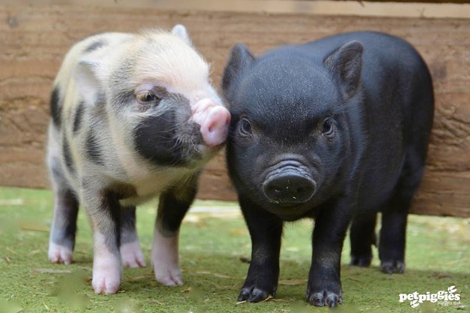 Meet micro pigs Samson and Delilah. Photo: Facebook/Petpiggies. Watch the video above to see Samson and Delilah plonk their tiny rumps on the ground and munch noisily on their apple treats. Despite slanderous stories about garbage scraps and swill, turns out some pigs actually have very healthy eating habits, and enjoy things like monkey nuts and a balanced breakfast. But apples are clearly their favorite snacks, as evidenced by these six week old piglets chomping on an apple the size of their heads. You know what they say: Healthy eating habits start when you’re a kid.